The Air Mobility Command Museum is proud to host an exciting event on 16 June 2018, from 11:00 am–2:00 pm, in the main hangar. 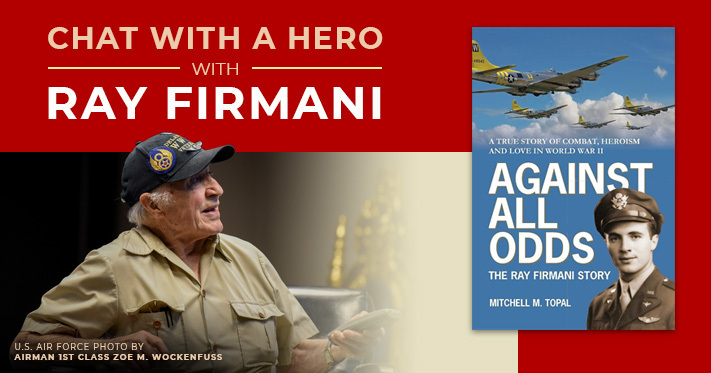 As part of our educational program we will be hosting a Chat with a Hero—The Ray Firmani Story. He was a B-17 pilot with the 486th Heavy Bombardment Group of the “Mighty Eighth” Air Force during World War II. He will be at the museum to share his life experiences with us, followed by a personal signing of his book, Against All Odds. Books will be available for purchase. A first-generation Italian-American who became the head of his household at an early age, Ray met every challenge life offered. Enlisting in the Army, he earned his wings. Against All Odds is an incredible true story of combat, love and heroism in WWII. The book tells of Ray’s life through his boyhood years, his military training, and him earning his pilot’s wings. It also describes Ray’s 25 harrowing combat missions, and his extraordinary heroism which resulted in his being awarded the Distinguished Flying Cross. Please join us for this rare experience of listening to, and talking with, a true hero from WWII. Will the book be available at the event to purchase for the signing? I’ll find out and update accordingly. Thank you for asking! Edit: Yes, books will be available for purchase at the event.